The new compilation series on EE TAPES after the well-received "The Walls Are Whispering…" Volumes I > III. Six artists from six different countries gather around the table and showcase their individual audio art. Six different forms of ambience, featuring exclusive tracks by: Objekt4 (Sweden) – Andrea Marutti (Italy) – Laurent Perrier (France) – Lutnahimat (U.K.) – June11 (Belgium) – Brian Lavelle (U.K.). 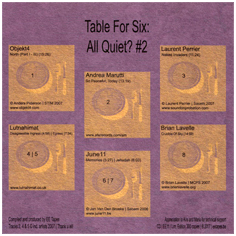 "About a year ago we reviewed 'Table For Six: All Quiet?' (see Vital Weekly 554), a neatly put together compilation by Belgium's EE Tapes, who already produced some great compilations called 'The Walls Are Whispering'. Now there is a volume two of 'Table For Six' and we come across some old, known names (at least to us), and some new ones. Objekt 4, Andrea Marutti, Laurent Perrier and Brian Lavelle are perhaps not household names, but they all have in one way or the other interesting releases to their name. Lutnahimat had one release on Entr'acte and June11 seems to be a new name. Each of the six artists get fifteen minutes to showcase their talent, and they all hoover about to some extent in some 'quiet' music. However don't confuse this with music below the threshold of hearing or some such. It's more about dark ambient than microsound if you get my drift. The CD opens with Objekt4 who plays a nice piece of sampled percussive sounds and some collated sounds. The dark synth by Marutti is perhaps the bleakest example of 'em all, but it's a fine one. Laurent Perrier doesn't forget his other work in the world of techno music, but incorporating rhythmic clicks in his piece, that however doesn't convince throughout. Lutnahimat has two pieces and seem to continue his interest in ambient glitch, but especially the short 'Disagreeable Ingress' is quite nice at that. Also June11 has two tracks, which seem to be more from the post rock background (I might be as easily mistaken here), with a sort of organ and guitar in a fuzzy bath. Lavelle closes the proceedings. It's been a while since I last heard his music, but 'Crucible Of Sky' is actually a nice piece of slowly evolving field recordings and piano sounds: melancholic autumn music which works quite nice indeed."